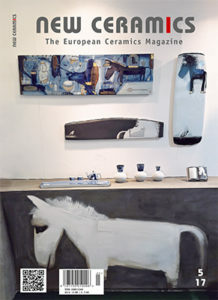 In the PROFILES section: Eight ceramic artists from Switzerland, Germany, United Kingdom, Spain, Netherlands, Romania/Belgium. Coverage of EXHIBITIONS and EVENTS in China, Romania, Cuba, Turkey, Germany, United Kingdom. In the section ARTIST JOURNAL, we present Karin Östberg and Lee Min-Soo . And we also have interviews with artists IN STUDIO as well as listings of Dates, Courses, Seminars and Markets. 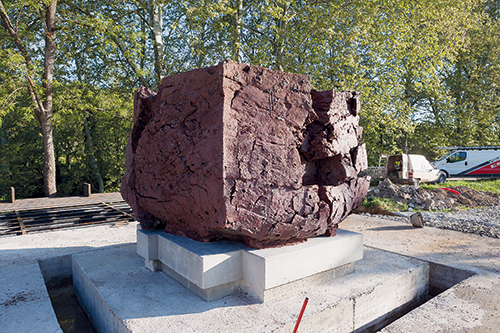 Artist of massive abstract forms, the works by Claudi Casanovas are profound, visceral and telling. 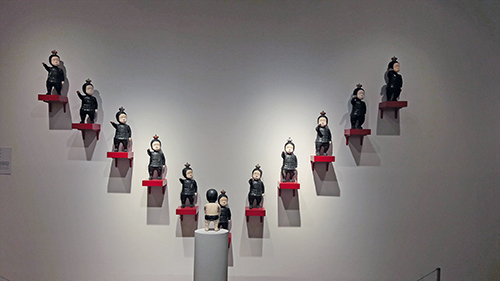 Being one of today’s most well-known ceramics artists worldwide, he does not need much introduction, but listening to himself talking about his work, along with some little stories and reflections, enriches what his work so powerful transmits. Lush vegetation on top of old volcanos surrounds his studio – volcanos that are inactive but not extinct, a precision that seems quite relevant in this context. No wonder the artist is a medium for expressing nature, a statement especially true for potters, but exact for Casanovas. Nearby, the town where he grew up in a family of artists, being his grandfather, a renowned sculptor of the Art Nouveau period. This town, Olot, is actually well known for its traditional painting school, which had his peak during the second half of the 20th century. Throughout her career Daniela Polz has been circling around the issue of what it means to be human, and how we, as individuals, are defined. 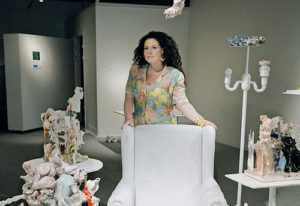 For the last 20 years since completing an MA in Cardiff, Wales, her work has been a discussion of the human condition through the medium of porcelain. Yet it is only recently that actual figures have appeared in her work. In the latest pieces, the human body is both appearing and disappearing simultaneously, speaking of a new intensity to her thinking about the condition of humanity and a more political aspect to the work. The most recent pieces she has made, a series of „Frames“, demonstrate a new level of maturity and sophistication in her work, a culmination of a long road of enquiry, and no doubt an exciting beginning for further sculptures. I have shared a studio with Margaret for 37 years and in that time I have watched her work with a focused single-minded attitude to her work, gradually abandoning all notion of that which is superfluous. She is, and she will tell you this, „self taught“, having had no formal training at art school or elsewhere. Our first „ceramic endeavors“ together in our studio were so beset with naivety I can hardly claim to have given her the benefits from my own art school training but rather I think we learned our craft together as we went on. She is resolute in her quest to work in harmony with her material. Her craft is well established and she works with a confident fluency, but her approach avoids any possibility of her work being „over-engineered“. 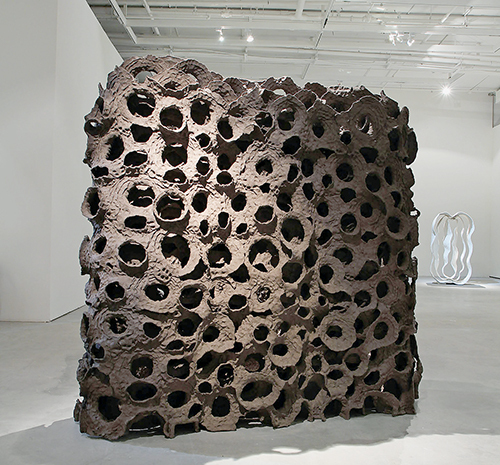 She alters and distorts her work to create naturalistic forms, sometimes squaring or squeezing rounds. One cannot reinvent the wheel, as the old saying goes. What is true of the invention of the wheel is equally valid for the ceramic vessel – it cannot be invented all over again, and historically it has a significance that cannot be overestimated. The history of human civilisation is inconceivable without this usually unobtrusive but universal object of daily use. Whereas the wheel can be assigned to the field of technology in human development, to the expansive, warlike impulse, and thus represents the male principle, the connotations of the vessel are entirely opposed to this. Gathering, preserving, containing and giving define the character of the vessel. 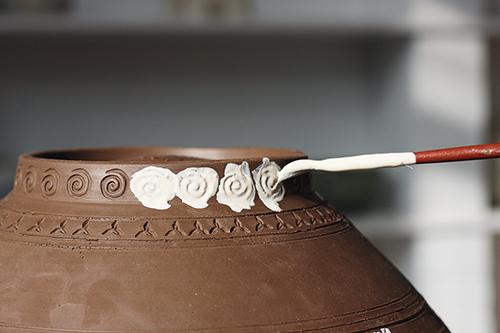 The handmade vessel represents the female principle. 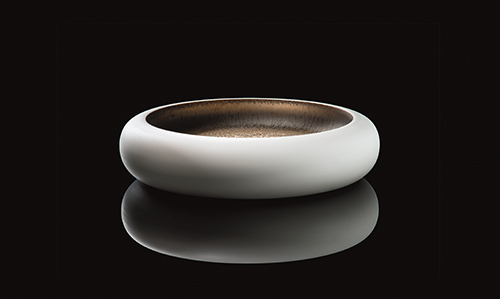 Ipek Kotan was not preordained to become a ceramist. From the outside, at least, nothing pointed to a career in the crafts, let alone the arts, for her at her birth in Istanbul, Turkey, in 1977. In retrospect, however, it seems as if the impressive nature of prehistoric vessels of the Mesopotamian culture in Turkish museums had implanted a love of ceramics in her as a child who was always attracted by fine art – an early influence, perhaps, that was later to bear fruit. We strive to learn about the creation of the world and of life, and about all the historic events which have occurred. We are overflowing with amazement about what we have come to know about the history of mankind. The transformation in knowledge and skill sweeps us along, even if we were not involved in how it developed. Idea and Perception: „Art raises its head where religions decline“, wrote Nietzsche. „Feeling, forced out of the religious sphere through the Enlightenment, throws itself into art.“ Max Pechstein spoke of this too. Neither yet knew what potential for miracles early human history contained. All the great religions of the world offer a key that is supposed to enable us to enter into the unknowable, where belief becomes certainty. It is merely a virtual key, impressed and drawn into the Talmud, the Bible and the Qur’an. We cannot overcome this frontier, but according to Max Pechstein, the realm of creative imagination brings us closer to God when we create. 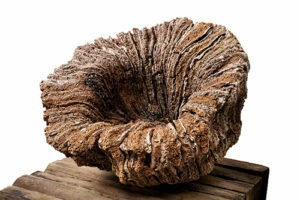 It was a minor sensation, or at the very least it made people turn their heads, when a ceramic sculpture by Dorothea Hoffmann was exhibited during the 1995 Westerwald Prize exhibition at the Keramikmuseum Westerwald in Höhr-Grenzhausen. The piece was only 40 cm tall and according to the catalogue it bore the title “Theatre”. In this context, the TV station WDR broadcast a profile of the artist. At that time, Dorothea Hoffmann was working in the creative workshops ALLERHAND in the rural south of Cologne – sadly, she is no longer alive. These workshops are run by GWK – Gemeinnützige Werkstätten Köln GmbH, a charitable organisation sponsored by several foundations such as the Neven-DuMont Stiftung, the Krämer-Stiftung and Aktion Mensch e.V. The studio has now moved to the lively Südstadt district of Cologne, where since 2014 it has had a new home in a protected historic former brewery, where it runs workshops, studios, a gallery and a coffee bar. In the spring of this year, I had the chance to experience the Gyeonggi International Ceramic Biennale (GICB) in South Korea. 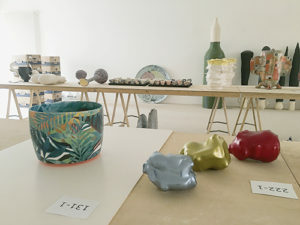 This international festival has been taking place for fifteen years and, with events in various venues and bringing together artists from seventy nations, it represents a unique spectacle that continues to push back the frontiers of contemporary ceramic art whilst simultaneously cultivating tradition. Story-Telling about Life juxtaposed fourteen contemporary artists who work narratively with works from the 1960s and 70s. 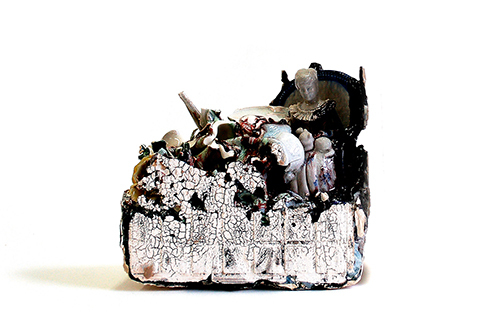 Memory – Remembering Life showed old Asian ceramics in all its facets and by means of 140 ceramic artefacts, e. g. funerary gifts, to give an insight into people’s lives in the past. It also gave eleven contemporary artists’s answers to this. 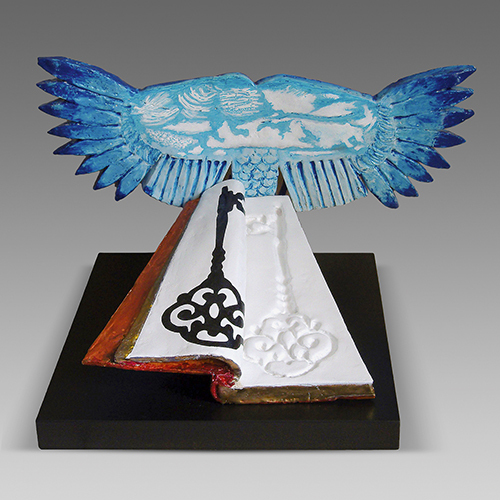 Pray – Cherishing Life presented 118 urns by contemporary artists as commemorative objects that do not make death a taboo but that celebrate a life that has been lived („We can cherish life more if we reflect on death“). The ICF celebrates its 30th anniversary in 2017. 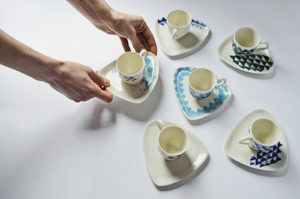 This Festival, which is renowned for its friendly atmosphere, has attracted countless ceramics fans and has become one of the leading ceramics events in the UK. It takes place every three years in the Arts Centre on the campus of Aberystwyth University, surrounded by the picturesque Welsh scenery. It offers teachers, students, artists, collectors, potters, amateurs and crafts lovers the opportunity to spend some instructive time intensively involved in ceramics with a programme full of variety and the opportunity to see the work of renowned potters working in all kinds of ways – from Wales, the UK and the rest of the world. 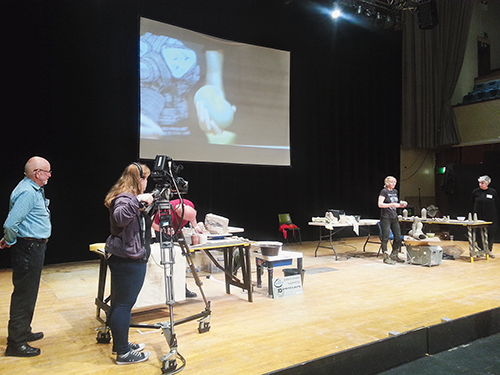 The artists present themselves and their works in talks and films, as well as giving practical demonstrations and insights into their individually developed skills and techniques, on the stage of the Arts Centre. For instance, Eddie Curtis shared the stage with Gerrit Grimm – with much verbal humour and repartee – so that the almost full house in the auditorium enjoyed the liveliest entertainment. The audience could interact freely with the artists, asking questions about their working methods, their ideas and processes. In addition, the demonstrators continues to work on these pieces at their own workplaces giving interested viewers the opportunity to discuss things in person. Karin Karinson was born in Sweden in 1970. 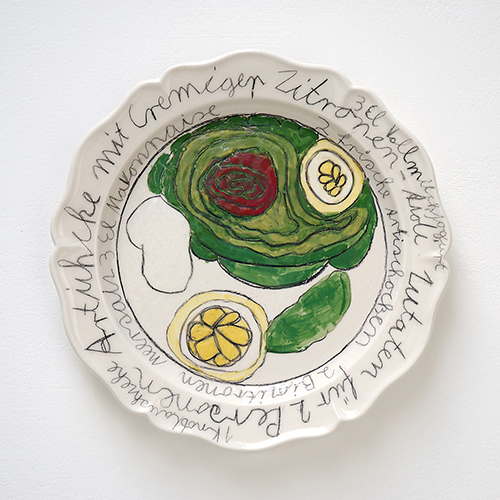 Karinson collected second-hand, mass-produced ceramics, and assembled them with clay, glass, and glaze. The ready-made products assumed to be tasteless and cheap were hence transformed into artworks with new appearances, changed fields, broad visions, and diverse connotations, which established different dialogues and interactions with the viewers. Hsu Yunghsu was born in Taiwan in 1955. The basic techniques such as coiling and kneading of clay slabs or strips, combined with the repetition of mussels, construct the life of the works. The artist’s ingenuity and every trace of where the fingers meet or press the clay can be perceived in the sculpture. Corrie begins her Buncheong workshops with making the stamps so that in the end every participant can find their own designs in the inlay on the object. As they work, they learn about the background and history of this ancient and beautiful Korean tradition. We can read about it in this interview. Corrie, our readers will ask themselves: a Scottish ceramist explaining Buncheong technique? But you lived quite a few years in Korea, didn’t you? And also in other countries around the world. Would you tell us your story? I was born in a remote part of Northern Scotland, and grew up in a small village on an island in Greece. 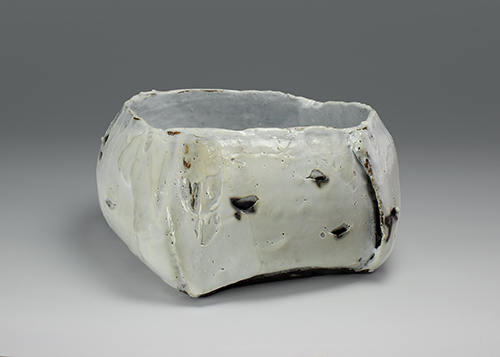 Being surrounded by artists and having a ceramist as a father meant I was in contact with clay since early childhood. I began drawing lessons when I was 12, which led me to art school. 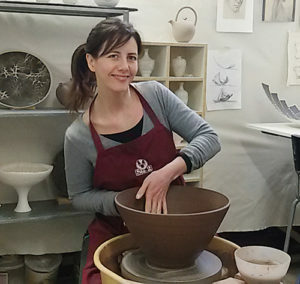 I studied a Bachelor of Arts in Design and Applied Arts specialising in Ceramics at Edinburgh College of Art, was an exchange student at Alfred University of Ceramics in New York, and achieved an Honours Degree in 2003.